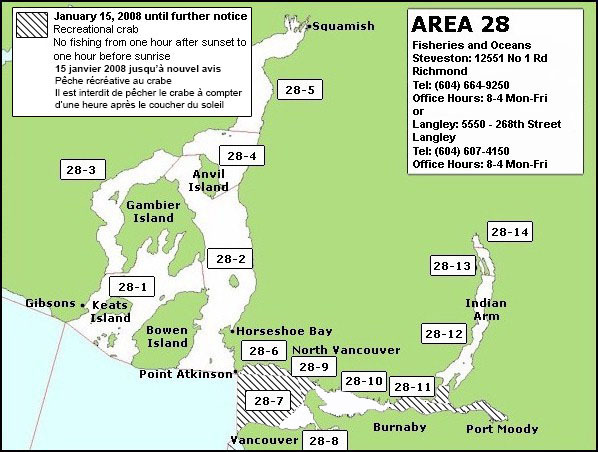 Area 28: Download a printable PDF version of this map. Finfish 28-8,28-10 Closed Closed to harvesting per navigational closures in sub-areas 28-8 (False Creek) and 28-10 (Burrard Inlet, partial). Closed to harvesting per navigational closures in sub-areas 28-8 (False Creek) and 28-10 (Burrard Inlet, partial). Shellfish Point Atkinson Closed Closed to all species of molluscs, echinoderms, crustaceans and shellfish. Closed to all species of molluscs, echinoderms, crustaceans and shellfish. Crab 28 Reminder Combined daily limit for Dungeness crab, red rock crab, box crab, Puget Sound king crab and all other king crab is 4. 28 Time of Day Restrictions It is prohibited to fish for crabs from one hour after sunset to one hour before sunrise each day. See Area page for closure map. 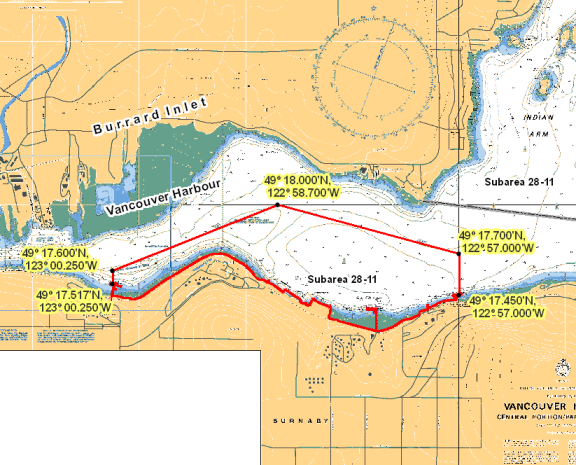 28-1,28-3 Dioxin Contamination (g/w) Consumption of crab hepatopancreas should not exceed 55g/week - consumption of crab hepatopancreas harvested in Howe Sound in subarea 28-3 and portions of subarea 28-1, in the waters of Thornbrough Channel, bounded on the north by a line from McNab Point on the mainland southwest to Ekins Point on Gambier Island, and on the south by a line from Gower Point to the southern tip of Home Island, thence north to Keats Island and along the western and northern shore to Cotton Point, thence west of a line to the government wharf at Gambier Harbour on Gambier Island, should not exceed 55 g/week. 28-1,28-2 Dioxin Contamination (g/w) Consumption of crab hepatopancreas should not exceed 130g/week - consumption of crab hepatopancreas harvested in Howe Sound and the Strait of Georgia in subareas 28-2 and 29-1 and portions of subareas 28-1, 29-2 and 29-3, in the waters bounded: on the north by a line from Brunswick Point west to Irby Point on Anvil Island and along the shoreline to Domett Point on Anvil Island, west to McNab Point on the mainland, on the west by a line from McNab Point to Ekins Point on Gambier Island that follows the eastern and southern shoreline to the government wharf at Gambier Harbour, then proceeds south to Cotton Point on Keats Island and along the eastern and southern shoreline, south to Home Island and continues from southern tip of Home Island west to Gower Point, then follows the shoreline north and west to Reception Point, then on the south by a line that goes from Reception Point east to a point 1.5 km true south of Cape Roger Curtis on Bowen Island, and finally east to Point Atkinson, should not exceed 130 g/week. 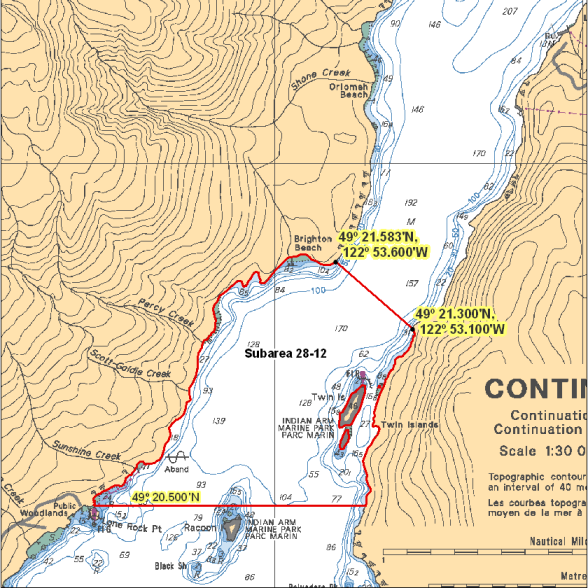 Night closure area Night_closure_area.jpeg Subareas 28-6, 28-7, 28-9, 28-11 and that portion of Subarea 28-12 southerly of a straight line from a point on the eastern shore of Indian Arm at 49 degrees 19.072 minutes North and 122 degrees 55.918 minutes West, on Turtle Head, to the most northerly point of Hamber Island, thence to the most northerly point of Grey Rocks Island thence to a point on the western shore of Indian Arm at 49 degrees 19.024 minutes North and 122 degrees 56.650 minutes West. Point Atkinson That portion of Subarea 28-6 bounded by a line commencing at the southwest entrance to Starboat Cove, thence seaward in a southwest direction for 85 m, thence westerly following the shoreline for 100 m, thence to the southernmost tip of Point Atkinson (125 m east of the lighthouse) [Point Atkinson]. Porteau Cove That portion of Subarea 28-4 east of a line drawn from the white fishing boundary sign located at the south shore of Porteau Cove, northerly in a straight line to the white fishing boundary sign located on the north shore of Porteau Cove [Porteau Cove]. Whytecliff Park That portion of Subarea 28-2 bounded by a line commencing from the southernmost point of Whytecliff Park, thence in a straight line to a point located 100 m east of the most south easterly point of Whyte Islet, thence following the southern shoreline of Whyte Islet at a distance of 100 m to a point lying 100 m from the most south westerly point of Whyte Islet, thence in a straight line to a point lying 100 m west of White Cliff Point, thence following the shoreline at a distance of 100 m in a northerly direction to a point 100 m north of Lookout Point, thence following the shoreline at a distance of 100 m in an easterly direction to a point 100 m perpendicular to the most northerly point of Whytecliff Park, thence to the northernmost point of Whytecliff Park on the mainland [Whytecliff Park]. Herring 28 Reminder Harvesting of herring roe from marine plants or plants placed in the water for the purpose of harvesting herring roe is prohibited. Codfish 28 Reminder Species includes: Pacific cod, Pacific tomcod, pollock and hake but does not include lingcod. Starboat Cove That portion of Subarea 28-6 bounded by a line commencing at the southwest entrance to Starboat Cove thence seaward in a southwest direction for 85 m, thence westerly following the shoreline for 100 m, thence in a northeast direction to a point on land. Moon Snail 28 Reminder Moon snails may be subject to PSP, check for closures. Consult your local DFO office for details. Shrimp/Prawn Coastwide Reminder Prawns with eggs: No person shall retain prawns carrying eggs, or remove eggs from the underside of prawns carrying eggs. All prawns carrying eggs externally on the underside of the tail shall be returned to the water immediately and in the manner that causes the least harm. Coastwide Gear Restriction Floats - Traps must be marked with floating tag or buoy that has your name on it. This includes traps tied to a boat or dock or fished from shore. If two traps are attached to one ground-line, it is sufficient to attach a tag, float or buoy that bears the operator¿s name to one end of the ground-line. 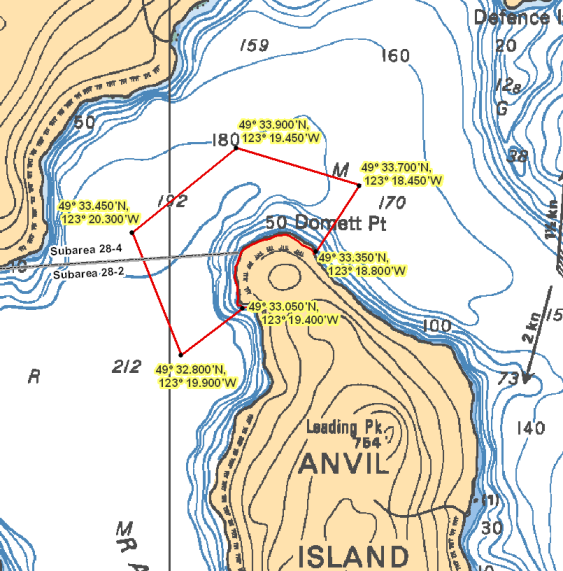 Bowyer Island Bowyer_Island.png In Subarea 28-2, those waters inside or shoreward of the 200 metre contour line that surrounds Bowyer Island, as shown on Chart No. 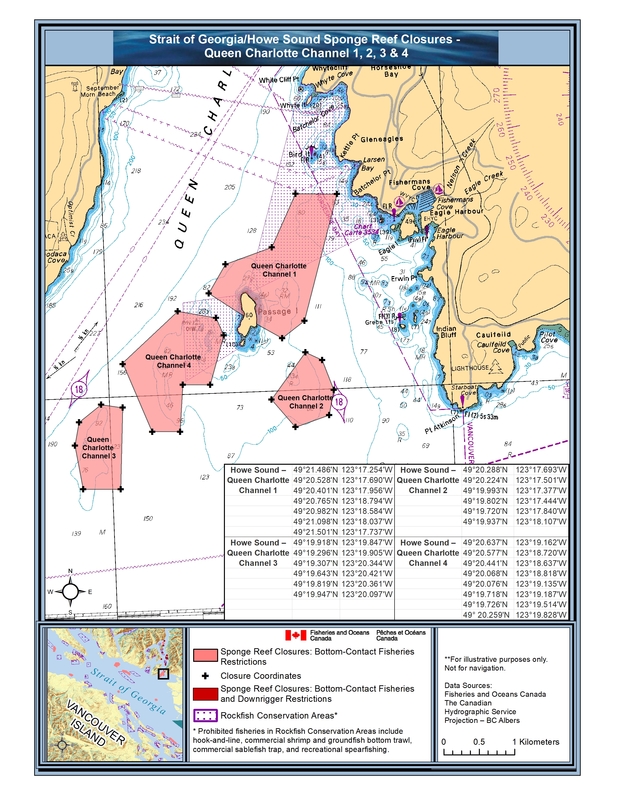 3512 published by the Canadian Hydrographic Service of the Department. 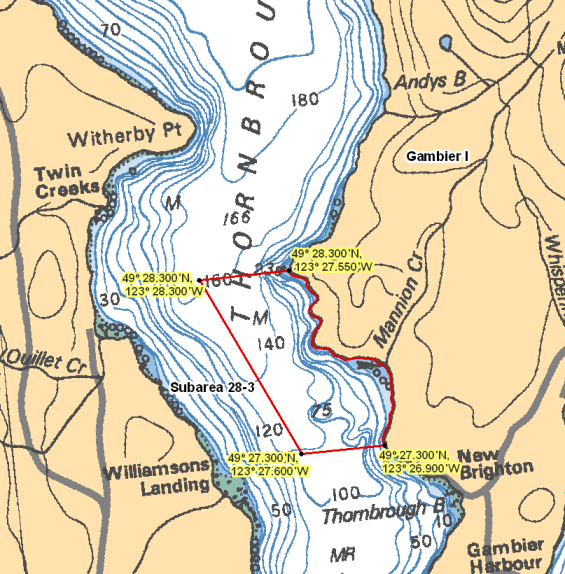 Domett Point Domett_Point.png In Subareas 28-2 and 28-4, those waters inside a line that: begins at 49°33.050'N 123°19.400'W near Domett Point then to 49°32.800'N 123°19.900'W in water then to 49°33.450'N 123°20.300'W in water then to 49°33.900'N 123°19.450'W in water then to 49°33.700'N 123°18.450'W in water then to 49°33.350'N 123°18.800'W near Domett Point then following the northerly shoreline of Domett Point in an westerly direction to the beginning point. Eastern Burrard Inlet Eastern_Burrard_Inlet.png In Subarea 28-11, those waters that lie inside a line that: begins at 49°17.517'N 123°00.250'W to the westerly most point on the Chevron refinery wharf then to 49°17.600'N 123°00.250'W in water then to 49°18.000'N 122°58.700'W in water then to 49°17.700'N 122°57.000'W in water then to 49°17.450'N 122°57.000'W Westridge Marine Terminal then following the shoreline in a westerly direction to the beginning point. Howe Sound - Anvil Island That portion of Subarea 28-4 that lies inside a line: begins at 49° 32.874' N, 123° 17.425'W then southeast to 49° 32.865' N, 123° 16.815' W then southwest to 49° 32.533' N, 123° 16.869' W then southwest to 49° 32.482' N, 123° 17.118' W then northwest to 49° 32.574' N, 123° 17.483' W then to the beginning point. 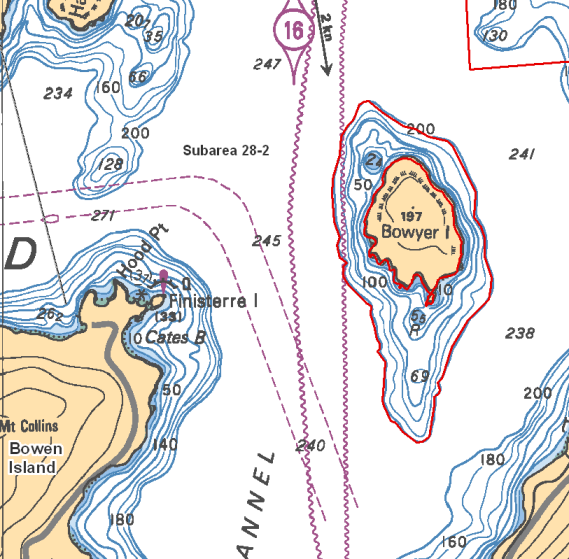 Howe Sound - Bowyer Island That portion of Subarea 28-2 that lies inside a line: begins at 49° 24.774' N, 123° 16.219' W then northeast to 49° 24.820' N, 123° 15.763' W then southwest to 49° 24.096' N, 123° 16.043' W then northwest to 49° 24.389' N, 123° 16.408' W then to the beginning point. Howe Sound - Brunswick Point That portion of Subarea 28-2 that lies inside a line: begins at 49° 28.577' N, 123° 14.965' W then southeast to 49° 28.434' N, 123° 14.732' W then southwest to 49° 28.177' N, 123° 15.031' W then northwest to 49° 28.397' N, 123° 15.377' W then to the beginning point. Howe Sound - Defence Islands Howe_Sound-Defence_Islands.jpeg That portion of Subarea 28-4 that lie inside a line that: begins at 49°34.102'N 123°17.070'W then southerly to 49°33.730'N 123°16.562'W then to 49°33.553'N 123°16.462'W then to 49°33.438'N 123°16.750'W then to 49°33.707'N 123°17.201'W then to 49°33.993'N 123°17.391'W then to the beginning point. Howe Sound - Halkett Point That portion of Subarea 28-2 that lies inside a line: begins at 49° 27.036' N, 123° 18.686' W then southeast to 49° 26.897' N, 123° 18.444' W then southwest to 49° 26.696' N, 123° 18.578' W then southwest to 49° 26.657' N, 123° 18.776' W then northwest to 49° 26.742' N, 123° 18.984' W then to the beginning point. Howe Sound - Lions Bay and Kelvin Grove That portion of Subarea 28-2 that lies inside a line: begins at 49° 27.629' N, 123° 15.761' W then southeast to 49° 27.315' N, 123° 14.516' W then southwest to 49° 26.950' N, 123° 14.595' W then northwest to 49° 26.952' N, 123° 15.046' W then northwest to 49° 27.195' N, 123° 15.655' W then to the beginning point. 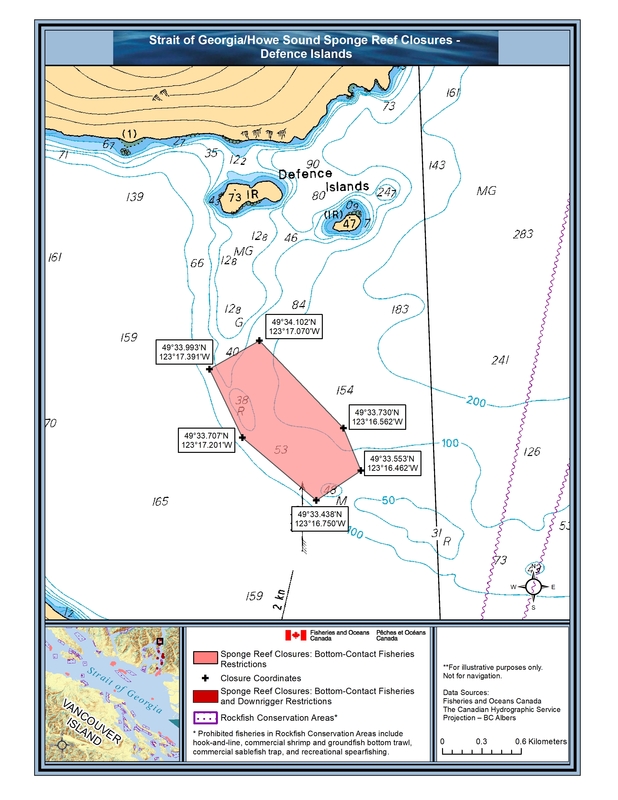 Howe Sound - Lost Reef That portion of Subarea 28-2 that lies inside a line: begins at 49° 29.799' N, 123° 18.203' W then northeast to 49° 29.935' N, 123° 18.007' W then southeast to 49° 29.882' N, 123° 17.832' W then southeast to 49° 29.591' N, 123° 17.519' W then southwest to 49° 29.547' N, 123° 17.941' W then to the beginning point. Howe Sound - Queen Charlotte Channel 1 Howe_Sound-Queen_Charlotte_Channel_1.jpeg Those portions of Subareas 28-2 and 29-3 that lie inside a line that: begins at 49°21.486'N 123°17.254'W then southerly to 49°20.528'N 123°17.690'W then to 49°20.401'N 123°17.956'W then to 49°20.765'N 123°18.794'W then to 49°20.982'N 123°18.584'W then to 49°21.098'N 123°18.037'W then to 49°21.501'N 123°17.737'W then to the beginning point. Howe Sound - Queen Charlotte Channel 2 Howe_Sound-Queen_Charlotte_Channel_2.jpeg Those portions of Subareas 28-2 and 29-3 that lie inside a line that: begins at 49°20.288'N 123°17.693'W then southeasterly to 49°20.225'N 123°17.501'W then to 49°19.993'N 123°17.377'W then to 49°19.802'N 123°17.444'W then to 49°19.720'N 123°17.840'W then to 49°19.937'N 123°18.107'W then to the beginning point. Howe Sound - Queen Charlotte Channel 3 Howe_Sound-Queen_Charlotte_Channel_3.jpeg Those portions of Subareas 28-2 and 29-3 that lie inside a line that: begins at 49°19.296'N 123°19.905'W then southerly to 49°19.918'N 123°19.847'W then to 49°19.307'N 123°20.344'W then to 49°19.643'N 123°20.421'W then to 49°19.819'N 123°20.316'W then to 49o19.947'N 123o20.097'W then to the beginning point. Howe Sound - Queen Charlotte Channel 4 Howe_Sound-Queen_Charlotte_Channel_4.jpeg Those portions of Subareas 28-2 and 29-3 that lie inside a line that: begins at 49°20.367'N 123°19.162'W then easterly to 49°20.577'N 123°18.720'W then to 49°20.441'N 123°18.637'W then to 49°20.068'N 123°18.818'W then to 49°20.067'N 123°19.135'W then to 49°19.718'N 123°19.188'W then to 49°19.726'N 123°19.514'W then to 49°20.259'N 123°19.828'W then to the beginning point. 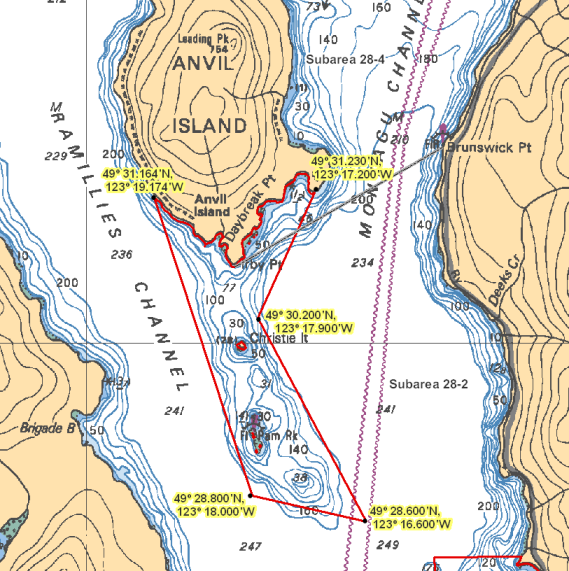 Indian Arm - Croker Island Indian_Arm-Croker_Island.png Those waters of Subareas 28-12 and 28-13 that lie southerly of the parallel passing through 49°27.000' north latitude near Granite Falls and northerly of the parallel passing through 49°23.400' north latitude, south of Coldwell Creek. Indian Arm - Twin Islands Indian_Arm-Twin_Islands.png Those waters of Subarea 28-12 the lie southerly of a line that: begins at 49°21.583'N 122°53.600'W Brighton Beach then to 49°21.300'N 122°53.100'W opposite shore and northerly of the parallel passing through 49°20.550' north latitude. 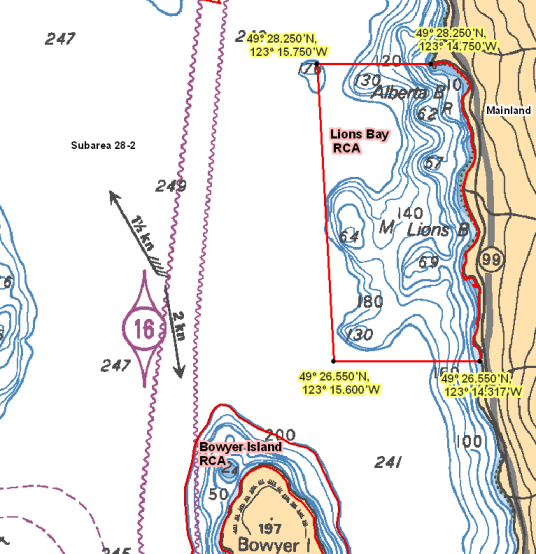 Lions Bay Lions_Bay.png In Subarea 28-2, those waters inside a line that: begins at 49°26.550'N 123°14.317'W near Lone Tree Creek then true west to 49°26.550'N 123°15.600'W in water then to 49°28.250'N 123°15.750'W in water then true east to 49°28.250'N 123°14.750'W Brunswick Beach then following the shoreline in a southerly direction to the beginning point. Mariners Rest Mariners_Rest.png In Subarea 28-3, those waters that lie inside a line that: begins at 49°27.300'N 123°26.900'W north of Thornbrough Bay then true west to 49°27.300'N 123°27.600'W in water then to 49°28.300'N 123°28.300'W in water then true east to 49°28.300'N 123°27.550'W Mariners Rest then following the westerly shoreline of Gambier Island in a southerly direction to the beginning point. 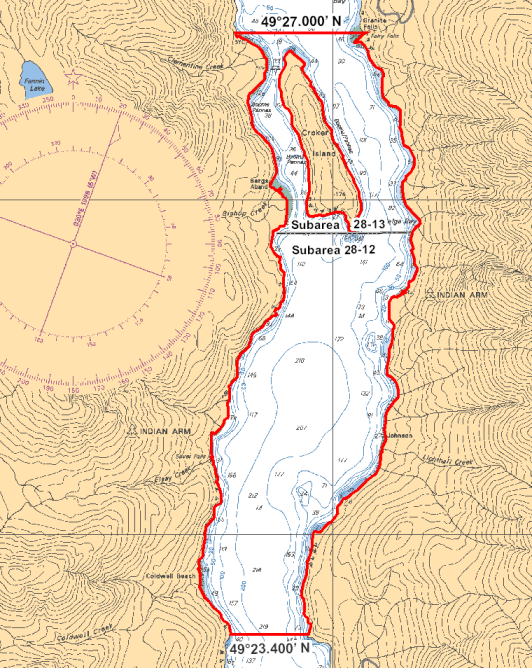 Pam Rock Pam_Rock.png Those waters of Subareas 28-2 and 28-4 that lie inside a line that: begins at 49°31.230'N 123°17.200'W Anvil Island then to 49°30.200'N 123°17.900'W in water then to 49°28.600'N 123°16.600'W in water then to 49°28.800'N 123°18.000'W in water then to 49°31.164'N 123°19.174'W Anvil Island then easterly following the southerly shoreline of Anvil Island to the beginning point. 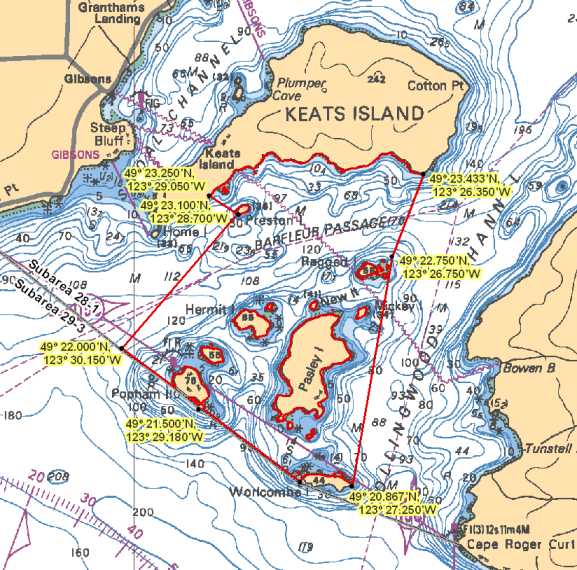 Pasley Island Pasley_Island.png In Subarea 28-1, those waters that lie inside a line that: begins at 49°23.433'N 123°26.350'W Keats Island then to 49°22.750'N 123°26.750'W in water then to 49°20.867'N 123°27.250'W Worlcombe Island then following the northerly shoreline of Worlcombe Island to 49°20.900'N 123°27.900'W Worlcombe Island then to 49°21.500'N 123°29.180'W Popham Island then to 49°22.000'N 123°30.150'W in water then to 49°23.100'N 123°28.700'W Preston Island then to 49°23.250'N 123°29.050'W Keats Island then following the southerly shoreline of Keats Island in an easterly direction to the beginning point. 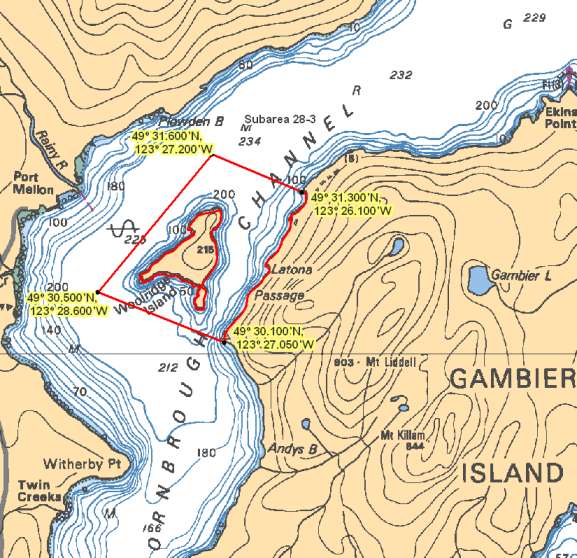 Passage Island Passage_Island.png In Subarea 28-2, those waters inside a line that: begins at 49°20.700'N 123°19.100'W in water then to 49°20.750'N 123°18.350'W Passage Island then following the westerly shoreline of Passage Island to 49°20.350'N 123°18.433'W Passage Island then to 49°20.100'N 123°19.100'W in water then to the beginning point. 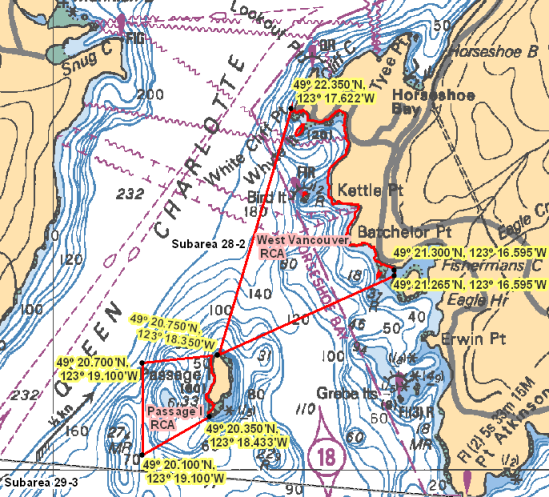 West Vancouver In Subarea 28-2, those waters inside a line that: begins at 49°20.750'N 123°18.350'W Passage Island then to 49°22.350'N 123°17.622'W White Cliff Point then southerly following the shoreline to 49°21.300'N 123°16.595'W Fishermans Cove then true south to 49°21.265'N 123°16.595'W Fishermans Cove Light then to the beginning point. 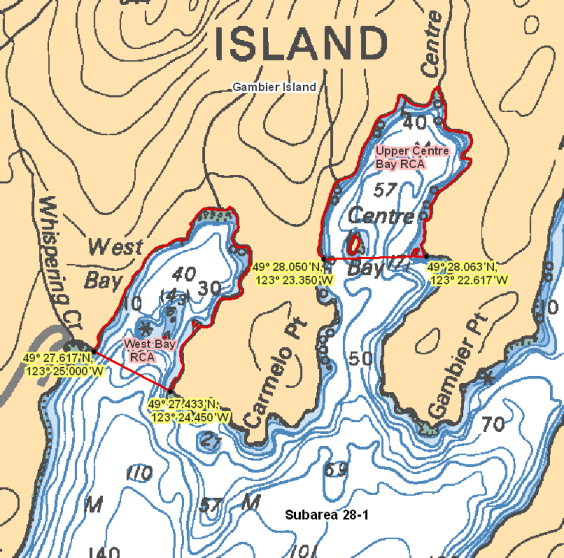 Woolridge Island Woolridge_Island.png In Subarea 28-3, those waters that lie inside a line that: begins at 49°30.100'N 123°27.050'W south of Woolridge Island then to 49°30.500'N 123°28.600'W in water then to 49°31.600'N 123°27.200'W in water then to 49°31.300'N 123°26.100'W north of Woolridge Island then following the westerly shoreline of Gambier Island in a southerly direction to the beginning point.